The wake of passing vessels and the turbulence of water coursing through a constricted channel conspire to keep the waters off Chek Jawa a turbid straits. A mere foot is enough to render the seabed into a swirl of sand and green, and at times, I would feel a stir under my soles as a buried animal squirmed and shifted a hazy foot away. While wandering the middle reaches of Chek Jawa's mudflat last Saturday, I stumbled on a jumbo mud crab half-buried in the sediment. Fearing perhaps the fate of a close cousin, the crustacean rose from its slumber and assumed a defensive pose, limbs agape and ready to deliver a crushing nip on soft flesh using pale teeth built to smash shelly fauna. Over a year ago, there was a beast in the same vicinity who displayed similar crabbiness. It's not inconceivable that a decapod of such proportions could have survived a season of storms and traps. With an armspan approaching two feet, the Scylla is a formidable creature with the strength to raise its torso above the substrate and lunge at threats within reach. 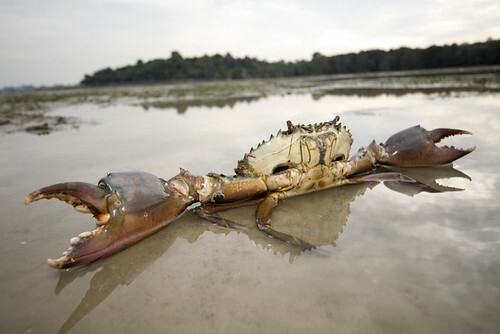 And unlike most of its family, who readily drown in dry air, the mud crab endures prolonged periods above water. Twice, the tip of its claws knocked the edges of the lens as I breached its comfort zone and the crab delivered brute, blunt hooks that would have hurt if they had hit home the way you do.